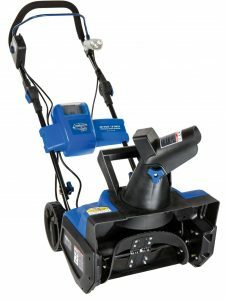 Description: This is a light weight snow blower excellent for clearing snow from sidewalks, decks and driveways where there is a light snow covering. It is quiet, does not need gas or oil and does not need an electric chord. There are no pull chords, tune-ups or carbon emissions to worry about. 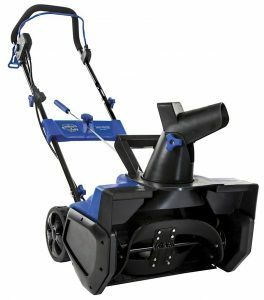 It will clear a path up to 18 inches wide and 8 inches high (see review section for the Snow Joe iON18SB Ion Cordless Single Stage Snow Blower). The manufacturer claims that this snow blower will throw snow up to 20 feet. The directional chute will rotate 180 degrees. Also the battery is supposed to last 50 minutes, although based on reviews some consumers found that the battery would not last this long. We have listed all of the features below for your information. The Snow Joe iON18SB Ion Cordless Single Stage Snow Blower has a total of 395 reviews at the time of preparing this post with an average rating of 3.9 out of 5 stars. There are two significant complaints about this machine. First, for some consumers, the battery just did not last long enough to finish the snow clearing job which can be very frustrating. Secondly, this is a machine that is really meant for light snow conditions. Light fluffy snow is really not a problem. Anytime you have heavier wet snow or icy particles, this machine did not or could not do the job. Before purchasing the Snow Joe iON18SB Ion Cordless Single Stage Snow Blower, give some thought to the type of snow conditions you experience. If there is a lot of snow, if it is wet snow, you may want to consider another model.